The number one thing as a student is to determine if you want to be a student athlete or a student at college. Once you have determined that it will make your college search much easier. For me, I wanted to be come a student athlete. With that in mind, it was my top priority to succeed at the sport I wanted to play at the next level, baseball. Baseball was and is my passion for a sport. I obtained a NCAA/NAIA College directory that contained all Divisions for every college you can imagine. 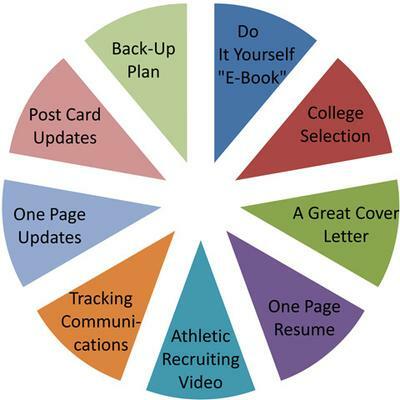 From that I put together an athletic resume', which I did extensive research on Google.com for examples so that I knew what the most important factors were to catch a college coach's eye. I then obtained 3 letters of recommendation from my high school coach, American Legion baseball coach and my amateur baseball coach. I also put together all my statistics from baseball, along with awards and newspaper clippings. I enrolled in the Baseball Factory program to have a video produced of my fielding, throwing and hitting. This all contained velocity, bat speed and 60/120 yard dash. This was copied of many other CD's and compiled and put into a very nice booklet along with an introduction letter that was mailed to about 50 Division I and Division II colleges. I followed up about 2 weeks later with an email to each and every one of those coaches. I received about a 50% return/feedback off of the product I sent out, with much interest. I then attended many college camps, went on college visits and college showcases. All of these did not go un-noticed as I had many many coaches sending me information and calling me. I then narrowed it down to the demographical area of which I wanted to stay in and pursued these colleges. It was about 5 colleges. to play baseball at a Division II college with a top rated national team and am very proud of that. The bottom line is you need to put extensive work into locking up the college of your dreams once you can determine the exact backing of what you would like to do once you get there. This will direct you on what scholarships to apply for and will push you to work hard for what you want. I have learned that the most important time to really make a difference is your junior year in high school, that is by far the most important year for colleges to see you and want you. I wish I had more direction that I did but I also know that I did receive quite a bit of helpful information from coaches and the colleges themselves as I started my search very early in my junior year. It is a choice that will make a huge impact on your life as you take a step to the next chapter in life. My mother has been there for me every step of the way helping and assisting me. This is another important support group, your parents. Your parents can pose some important and valuable information and criteria to think about and consider. College is a huge decision, I guess I never thought it was this hard of a decision to make and didn’t realize the impact it will leave. I am happy with my decision and can tell you if you are a student athlete please take into consideration the items I stated above. It is a process and if followed and researched accordingly I believe you will have much success in your future as well. Thank you Brennan for sharing some great tips from a student athlete for finding the college of your choice. Best of luck to you and may you hit many home runs. As a high school student or even a young child, there is that one college that interests you whether it be for sports, the atmosphere, or just because it is your hometown. For example, I loved watching the University of South Carolina Gamecocks on television because they seem to always keep an excellent football program going. When I reached high school, I had my eyes set on that school whether I go on a football scholarship or go on an academic scholarship. In my head, I know I had to work hard for this opportunity. I was actually performing well on the football field and off, so good that the University of South Carolina was actually starting to look at me. However, an unfortunate accident happened to me in the jamboree before the season started. I suffered a severe injury and tore my anterior cruciate ligament, better known as my ACL. Along with my ACL tear, my dream school stopped looking at me. On the bright side, I still performed academically well in the classroom. You have to make that a priority as a student. I searched hard online to find any scholarship opportunities I could and filled them out as quickly as possible. I even went to USC and visit the campus and facilities there. I liked the atmosphere and I like the feeling of being on the campus. I showed much interest while at the school, meeting some teachers, coaches, and football players. I presented my self as an all-around good student by dressing appropriately, speaking loud and clear, and most importantly looking people in the eye during a conversation. Doing all these things paid off because I eventually got accepted to USC. Even though I got accepted to my dream school, there was an alternative school that also had my interest which was Claflin University. My choice for school was made when I got all type of scholarships from Claflin. Going to your dream school is always good, but I could not turn down that money. After all, my school goal was to earn any money I could for college. Sometimes you have to make decisions that are best for you rather than what you would like to do. I still always reminisce about where I would be right now if I had not experienced my injury, but I have moved on. Well this is my story and I hope I touch anybody who reads this. Thank you and God bless. Thank you Raymone for sharing your Hopes and Dreams. Sometimes one school will provide such a great financial aid offer that it is hard to pass up the opportunity. Best of luck to you. Click on this link to apply online for our scholarship contest.